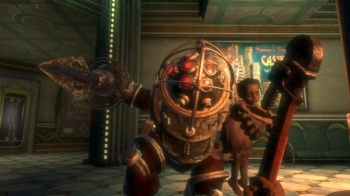 Irrational Game's Ken Levine thinks that viewing a game through the protagonist's eyes makes it easier for the player to become someone else. When we were kids, we could become someone else in the blink of an eye, leaving behind our mundane personas and becoming a space commander or a ninja wizard with ease. Sadly, it's much trickier to do it as an adult, but Levine thinks that one of the advantages of first person games is that it helps the player tap into that part of themselves again. Levine felt that playing games with a first person perspective was the most direct way to engage with them. It helped put the player in the character's shoes and removed one of the barriers to getting him or her fully immersed in the experience. He thought that getting the player to "transpose" his or her identity onto someone else's, which was easier to do in a first person game, could lead to a very powerful experience. He said that it was difficult to get adults to do that, as they were usually too self-conscious, but thought that games could often give them a gentle push in the right direction. You can't really argue with Levine's point, especially not when he's demonstrated just how immersive the first person perspective can be time and time again with games like System Shock 2, Thief: The Dark Project and BioShock. Of course, it's also fair to say that third person perspective games can be just as immersive if they're done well, although that's not something that Levine really seems to be disputing.